I was recently having a casual conversation with my 15-year-old after picking him up from work one evening. He politely asked, “What have you been doing tonight?” I sheepishly confessed that I spent the last hour or so binge watching Monkee videos on YouTube. His reply was, “Who are The Monkees?” I was perplexed, how could he not know about The Monkees? What are they not teaching our children in schools these days? 🙂 I immediately showed him the video of the introduction to their show – and he had no interest whatsoever. Which made me reflect – why were they such a big deal when I was young? I had never seen anything like their TV show – a fast-moving combination of comedy, drama, and music videos. In 4th grade, I wanted to change the spelling of my name from David to Davy – but I couldn’t afford the legal fees. And this was my first introduction to rock and roll music besides the only album I owned – Donny and Marie’s Greatest Hits. Since 2016 is the 50 year anniversary of their conception, I decided to investigate the story of Micky Dolenz, Peter Tork, Michael Nesmith, and of course, Davy Jones. 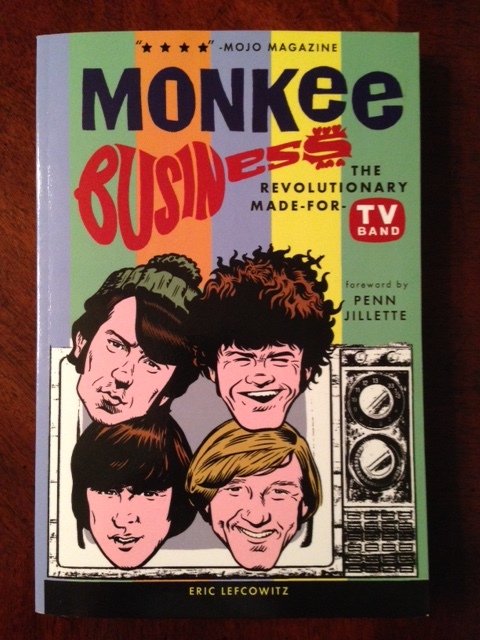 Here’s a brief discovery what I learned behind the music after reading Monkee Business by Eric Lefcowitz. *A highly visionary production and management team took 4 relatively unknowns from an open casting call, and made the group a world-wide sensation. *Despite the perception, they were not rivals with the Beatles. Both groups had mutual respect for one another, and they occasionally would hang out. *At one point, The Monkees albums were outselling The Beatles and Rolling Stones combined. *Stars that had a connection with them early in their careers: Jimi Hendrix, Jack Nicolson, Carole King, Neil Diamond – even Seinfeld & Leno appeared as young comedians on a variety show Michael later produced. Strengthening of the Boy Band concept and mega-marketing of merchandise. The foundation behind a variety TV show (comedy, drama, and music). Music videos with lip syncing, multiple camera angles, and concert footage. In fact – Michael came up with the idea of a 24 hour music network later known as MTV. The Monkees experimented with concert lighting – including the radical idea of shining the lights out into the crowd. They planted the seeds for reality TV – frequently their shows would end with unedited interviews with the band members. They made reunion tours cool, and also it became hip for parents and kids to attend the same concert – not for supervision, but for entertainment. *A dispute went on for years: The Monkees wanted to be a real band and play their own instruments (Peter & Michael were actual musicians) – but the producers, writers, and managers wanted them to be a fictional band using their own voices, but studio professionals to provide background vocals, write songs, and play the instruments. *The group fired legendary producer Don Kirshner who helped them have multiple hit singles and Billboard topping albums. They rejected the song “Sugar Sugar”, which later became a hit for The Archies. *They fell into the basic patterns of self-destruction that haunt the majority of young people who suddenly come upon wealth and fame without being grounded: bad contracts, strong egos, dishonesty, money on bad investments and pleasure, lawsuits, non-stop squabbles over money, and airing grievances about each other with the press. Sadly, they didn’t consider themselves close friends after all those years – mostly business partners. *The group admitted to being “high” during the filming of some the TV show episodes. *Their squeaky clean image was basically an image – most of the group conformed to the peer pressure of the 60’s of drugs, alcohol, wild parties, and groupies. At one point Peter had squandered millions of dollars and was living with his daughter as an alcoholic in a shelter for $25 a week. He also had a brief stint in prison for drug possession. *After the break up – Micky struggled with substance abuse and lethargy. Michael tried to distance himself from the group and was non-committal every time a reunion tour occurred. Davy at one point claimed that “The Monkees ruined his acting career.” He unexpectedly died of a heart attack at the age of 67. I had this group on a pedestal when I was a kid and must admit – I was disappointed hearing about all their shortcomings after reading this book. Somehow I had an image in my mind that they were immune from corruption. No one can deny, The Monkees had quite a run for 50 years. Their memories will remain forever etched in their fans hearts. Please leave a comment below or on FB regarding who your favorite Monkee is, and number one song you think they sing. Me? Davy, of course. And “Daydream Believer” for top song. Really liked this one — didn’t know any of their history–nothing about them. Therefore, I have no favorite song and the only name I really remember was Davy….Saw the album countless times in your room when I went to clean it…..:) :). It reminds us of today with all of the pro athletic stars, olympic stars, current movie stars, etc.—-waste—-too much money, very few know how to handle it, I was listening to Paul Anka upstairs when you were downstairs listening to The Monkees and Kiss!!! !